A year-round favorite! Our high quality 100% cotton tie-dyed shirts are available in a wide array of patterns and color combinations. Children's & Adult sizes. 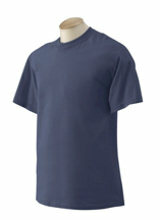 100% cotton T-shirts in a wide variety of solid colors. Adult sizes. Available year-round. Color selection varies seasonally. 50%/50 poly/cotton heavy-weight sweatshirts. Available in solid colors. Available year-round.